There’s a Party Going On – Saturday May 18th, 2013 on Facebook! 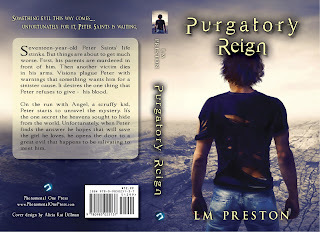 AND…are you listening… AND … A Facebook release party PURGATORY REIGN a facebook Release Party! 6 hour Party with Spotlight Authors, trivia games, food, itunes gift cards, list of freebie party favors, interactive chatting, singing, dancing, nonstop games, music, prizes and free stuff!! Author segments each hour that are themed and more giveaways!!! Starring 5 other authors and blog hosts, tons of prizes and fun. Seventeen-year-old Peter Saints’ life stinks. But things are about to get much worst. First, his parents are murdered in front of him. Then another victim dies in his arms. Visions plague Peter with warnings that something wants him for a sinister cause. It desires the one thing that Peter refuses to give – his blood. Peter carries within him the one gift or curse that could unlock a secret to destroy the human race. On the run with Angel, a girl disguised as a scruffy kid, Peter starts to unravel the mystery. It’s the one treasure the heavens sought to hide from the world. Unfortunately, when Peter finds the answer he hopes that will save them, he opens the door to a great evil that happens to be salivating to meet him. He’s the most evil, conniving, slightly deranged character I’ve ever created. And he scares me. I’m going to share just a taste of what happens when he comes on the scene. Gavin knew from experience he’d only have a short time to get his answer before the greedy one would consume the spirit in which it hid and demand the price. “The name of the one who can stop me, the one I should remove from the equation,” he demanded from the psychic. Her body jerked from side to side in an attempt to fight her way free of an invisible force, but it was too late, the price would be paid. For one moment, shock and fear laced her expression before she slumped to the floor, permanently silenced. He slipped his hands into his pocket, pulling out rubber gloves and a knife that he calmly unfolded. For a brief moment he stared in space while in thought. “Peter. Peter Saints.”the sound of the name left a foul taste on his tongue. Shrugging off his jacket, he grinned. Messes, he hated to leave messes. And tonight, like all the other nights, he’d clean it up.